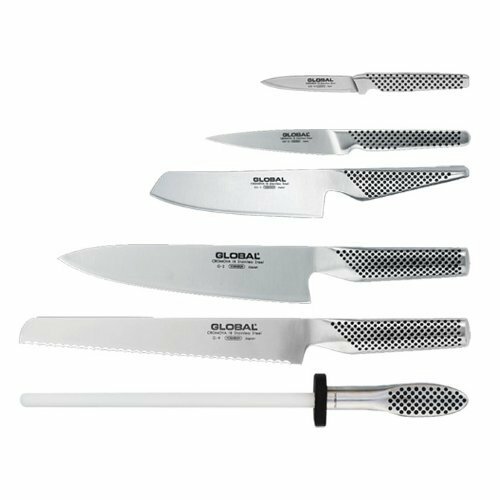 The 7 piece Takashi Global Knives block set includes: G-2 8" Chef's Knife, G-9 8.5" Bread knife, G-74 Ceramic sharpening rod, GS-5 5.5" Vegetable knife, GSF15 3" Peeler, GSF-22 4.25" utility knife, wood knife block. View More In Knife Block Sets. CUTCO Model 1838 Entertainer Set in special CUTCO gift box. ......... Includes 1501 Peeler, 1502 Pizza Cutter, 1503 Ice Cream Scoop, and 1504 Cheese Knife. ........ High Carbon Stainless blades and black soft-grip handles.